Okay, so judging from the weather outside right now, it definitely looks as though summer might be coming to an end - which is simply something I'm not ready to accept right now. As much as I adore autumn, I am a summer baby and after the pretty disappointing summer we've had, I'm hoping an Indian summer might be on the cards for September. Also, I know a lot of people have their holidays around this time of year, so it seemed like a good opportunity to share Feel Unique's fab Summer Time Beauty Box with you all. I was sent this a few weeks back and have been putting the products in it to the test - and I have to say I'm really impressed with them all. 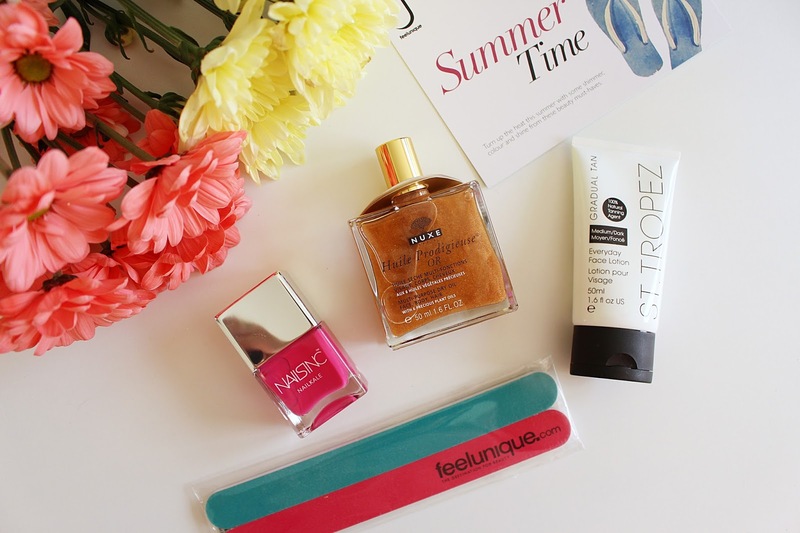 The Summer Time box includes the NUXE Huile Prodigieuse Golden Shimmer, St. Tropez Everyday Gradual Face Tan, Nails Inc. Regent's Park Nailkale polish and some Feel Unique duo nail files - basically everything you need to look glam, glowing and gorgeous. Whilst the nail files don't excite me too much, everything else in the box really, really does. I've wanted to try St. Tropez's Gradual Face Tan for ages so this 50ml tube was perfect - and I'm really impressed with the results. It smells nice, doesn't streak and gives a really good colour that fades evenly - definitely one of the best facial fake tans I've tried. The Nails Inc. Nailkale polish is INCREDIBLE - it gives you super glossy, strong nails, only needs one coat to get a full coverage and is really chip resistant. The shade Regent's Park (which comes in the beauty box) is the most stunning bright raspberry pink which looks ideal with a tan. I've always been a fan of Nails Inc. polishes but this one is up there with the best they do - the introduction of kale extract (which has high levels of vitamins and is meant to be great for moisturising the nail) has certainly made all the difference. Finally, a product I was really excited to try was the NUXE dry oil. This smells beautiful, looks like the definition of summer in a bottle and is a fab multi-purpose product - you can use it on your face, hair and body. It has golden shimmers throughout which make it great for applying of an evening to give your skin a gorgeous sunkissed, golden glow, and I think it's a must-have if you're heading away on holiday. Overall I'm really impressed with the Feel Unique Summer Time Beauty Box and would highly recommend it - especially considering it costs just £27 and is worth £54. It makes a great gift for anyone heading on their holidays, or a perfect treat for those of us hanging on to the remnants of summer! Have you tried any of Feel Unique's Beauty Boxes? Let me know!